Where can you stream Is It Wrong to Try to Pick Up Girls in a Dungeon?? 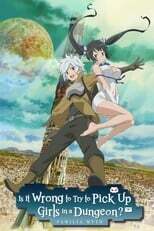 On 2015-04-04 Animation/Comedy TV Series Is It Wrong to Try to Pick Up Girls in a Dungeon? first aired on Tokyo MX. Written and created by Fujino Ōmori, and produced by J.C.Staff, Is It Wrong to Try to Pick Up Girls in a Dungeon? will return and was last broadcasted on 2015-06-27.